Don't see your exam on the list? Maybe it's a CLEP exam or an ECE exam. When you're ready to make every minute of study time count, you're ready for InstantCert. InstantCert gives you everything you need to prepare for your exams in one place; it makes test prep easy. When you're ready to more effectively prepare for your DSST exams, InstantCert is your one-stop solution. Regardless of your background knowledge of the subject, your test-taking skills, or the difficulty of the particular exam you're studying for, InstantCert gives you as much–or as little–as you need to pass the exam. The core of the system comes from our interactive flashcards. These teach you everything you need to know to achieve a passing score. Only the main points are covered by multiple-choice but the fill-in-the-blanks format keeps your mind engaged and processing the info. Very quickly you will learn the fundamentals of the subject and go from zero knowledge to exam-ready in a matter of days. Students looking for more than just a passing grade can join our online forums. Here you will get exclusive access to several years� worth of posts from members who have already taken your exam and share exam-specific information–detailing what they used to prepare, what topics to focus your studies on, and their personal suggestions to help you to duplicate their success. Beyond the test preparation materials, InstantCert offers you something that no other test prep provider can. When you join InstantCert, you're joining a community of test takers; you're instantly connected with thousands of other students like you who are pursuing college credit through examination. Every time you log in to InstantCert, you'll see the dozens of other students that are logged in and studying at the same time as you, and through the forum and our private messaging system, you will be able to interact with them and benefit from their experience. Finally, no other test prep provider is going to give you access to the kind of unfiltered, honest customer evaluation of their own product like InstantCert offers of our flashcards. Nothing is more confidence inspiring than logging into the Members' Area and seeing the steady stream of real-time test results being posted by members as they take their exams. These are uncensored, real-life results posted by people just like you who are going in and taking these exams–pass or fail, their results are there for you to see. 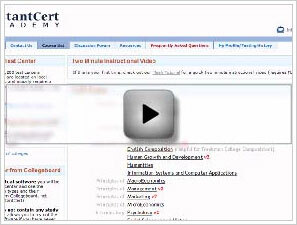 Click on the tabs above to learn more about InstantCert. InstantCert's flashcards use an interactive, fill-in-the-blank format to teach you everything you need to know in order to pass your CLEP or Dantes exam. Just study the database of flashcards for the exam you're going to take until you're comfortable with the material, and then go in and take the exam with confidence! How are the Flashcards Developed? InstantCert Academy obtains the official textbooks for each course as recommended by the College Board. We then follow the College Board's official published content outline which breaks down the courses by topics and the percentage of each topic as it is covered on the exam. Finally, our subject matter experts carefully develop Flashcard questions in proportion to how much of the test is dedicated to each topic within the course. Our research and development make the Interactive Flashcards a comprehensive study guide covering the most important material on each subject?s CLEP exam. Are these flashcards very similar or identical to the questions on the test? No. We do not hand you a copy of the exam. The flashcards teach you the fundamentals of the subject–the same things you would learn if you were to take a standard college class in the subject. Knowing the information in the flashcards will enable you to determine the correct answers on the actual exam on your own. If you're not teaching the test questions, how can you be sure that I'll pass? For you to understand why our approach works, you have to understand how the Collegeboard develops and validates the CLEP exams. The Collegeboard develops each exam so that it reflects the content covered in a standard undergraduate course in the subject. They then validate the exam by administering it to normal college students who have just completed a college course in the subject. These are not students who have had any CLEP-specific training or instruction. The exam is then weighted so that an average C-level student can pass the test. In other words, if a C-level student in an average college can pass the CLEP exam, you also can pass it just by studying the fundamentals of the subject, which is what InstantCert's flashcards teach you. The actual exam is multiple-choice. Why are your flashcards fill-in-the-blank? Fill-in-the-blank has proven to be a very effective way to teach large amounts of information. Our goal is to teach you the fundamentals of the subject–not to simulate the actual exam. The problem with multiple choice is that you often end up memorizing the position of the answer or learning to recognize it based on a couple of words. With fill-in-the-blank, you actually learn the information. Just think–if you know the information well enough that you can recall it from memory for a fill-in-the-blank question, you're definitely not going to have any problems when it comes to recognizing the answer on a multiple-choice test. What makes your flashcards superior to the other CLEP prep options out there? You Learn the Material - Many test prep providers promise to teach you just what's going to be on the test. You memorize a couple hundred multiple-choice questions or you study a few pages filled with a seemingly random set of disparate, unconnected facts. You may pass the test, but in the end, you won't really know anything about the subject. With InstantCert, on the other hand, you actually learn the fundamentals of the subject–the exact same information you'd learn if you had spent a semester sitting in a brick-and-mortar class at your local college. You Know That What You Are Studying is Relevant to YOUR Test - As we mentioned before, many test prep providers claim to teach you only the questions that are going to be on the test. The problem with this approach is that, generally, their materials are based on only one or two versions of the test. What happens when the test gets revised or you take a version of the test that they haven't seen? Considering that failing a test means waiting 6 months to retake it (along with the lost testing expenses), this is a risk you may or may not be willing to take. With InstantCert, you're not studying test questions–you're essentially studying the textbooks that the tests are based on. This means that no matter what version of the test you take, what you study in our flashcards is going to be relevant to the questions on your exam. You Can Prepare for your Tests Quickly - InstantCert's flashcards may be thorough, but that doesn't mean that they take longer than other study resources. The average study time for a test is only around two weeks, and this will vary depending on the difficulty of the exam you're taking, your previous knowledge of the subject, your study habits, etc. Some members have reported passing exams with as little as two or three days' study. You Know Exactly When You're Ready to Take the Exam - The problem with many other forms of test prep is that it's difficult to know when you're ready. You may have read through the study guide several times and tried your best to memorize all of the information, but there's no obvious indicator that you are ready to take the test. With InstantCert, you'll know exactly when you're ready; the flashcard software will let you know when you've achieved mastery of the material. There's no better way to know if our flashcards work than to try them out for yourself. Click here to try out a 30-Day Risk Free Trial and get instant access! General Education Discussion - This is where the majority of the activity occurs, where forum members discuss everything education and testing related. Here you will find open discussion about the best way to prepare for an exam, which exams are easiest, whether brick-and-mortar schools are superior to online universities, and thousands of other topics. Discussion Related to the Big Three - The Big Three refers to three of the most widely known accredited online colleges where a degree can be earned entirely by examination– Excelsior College, Thomas Edison State College and Charter Oak State College. Many forum members are enrolled in one of these three institutions or are considering it. Here you will find discussion about degree plans, how best to fulfill degree requirements, how employers react to a resume that has an online degree on it, and much more. Specific Exam Feedback - This area is limited to posts from members who've taken an exam and want to share their score and advice for others who are preparing for the same exam. The forum isn't just a source of information. It's a real community of people who encourage, motivate and inspire each other! What is our Specific Exam Feedback Area? 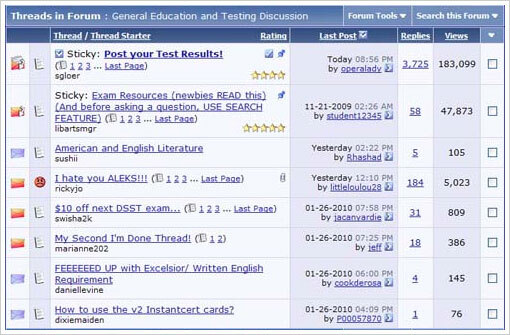 What Exam Prep Resources They Used - If they used something in addition to or in place of InstantCert's flashcards, they let you know what they used, their opinion of those other resources, and what they thought of InstantCert's flashcards. What Topics to Focus Your Studies On - It can be very helpful to know where to focus your efforts, especially when you're dealing with a particularly broad or difficult subject. Other Advice - Based on their experience studying for and taking the exam, members often offer critical advice on how to avoid mistakes that they made or general tips on how to do well. Every day, members contribute new testing experiences and insight into the exams. InstantCert's flashcards teach you everything you need to pass your exam, but the Specific Feedback Area can help you to achieve a higher score and improve the quality of your studying time. It isn't limited to the exams we offer flashcards for; the 2,500+ posts you'll find there cover basically all of the CLEP and Dantes exams, many of the Excelsior exams, and even some of the GRE exams. Between the discussion forum and InstantCert's flashcards, many members have said that it's practically impossible to fail your exam. Click here to try out a 30-Day Risk Free Trial and get instant access! 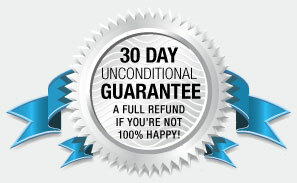 Test It Yourself for 30 Days – Then Decide! You needn't take our word for it. The only sure way to prove the InstantCert Academy program will work for you is to put it to the test of actual use… in your own personal situation. Use it at our expense for 30 days – then decide! If the InstantCert Academy program doesn't equal or exceed your expectations, then simply cancel your Membership at anytime for any reason during the first 30 days - just tell us you want to cancel and you'll promptly receive a full refund. Grab our Zero-Risk Offer! According to our records, 97% of our students have quickly earned college credit by easily passing the CLEP* exams they took. The reason is simple - our unique program works! And our 100% Risk Free Guarantee is that you'll pass CLEP* Exams within your first 30 days – or your money back, no questions asked! Now is the best time to find out why our InstantCert Academy Membership has won such overwhelming acceptance. Click here to try out a 30-Day Risk Free Trial and get instant access! Below is just a fraction of the hundreds of testimonials we've received from satisfied customers over the years. Remember–these are limited to people that actually took the time to write in and express their enthusiasm for our product. In the Members' Area itself, you'll be able to see thousands of unfiltered test results reported directly by users, with members adding fresh new results every day as they take their tests. These test results are there for you to see–whether they be pass or fail–but you'll notice that nearly all of the scores reported (an average of 97%) indicate passing their test! Unbelievable, but I passed all three. Instantcert is great and it works?I will be telling all my friends. I just wanted to say thanks for providing an excellent service for those who want to speed up the degree completion process. Your website helped me pass the Sociology and College Mathematics exam and I am actually graduating tomorrow! I'm justing emailing you to let you know that I just got a 59 (passing score) on Microeconomics in this morning. I only used your site. Why didn't somebody tell me about these Clep exams when I was young? I'm really excited and I usually don't get excited about anything anymore.There is a Bachelors degree in my near future and hopefully a better job. I would just like to say that your site has just helped me pass a Humanities Clep exam. Before I had found the site I was studying other sites and did not comprehend or learn as much as I did from yours. I can absolutely say that your site gave me the tools to pass this exam, without question. I will recommend it to everyone I know who is thinking about taking the CLEP/or Dantes for credit. I just wanted to let everyone know that the service that you offer is fantastic! I had been told about the CLEP test years ago, but I was always apprehensive about trying them. I had heard horror stories about not having adequate resources to prepare, and just hoping to pass. Well, I needed two classes to graduate and I didn't have time to take the classes and still graduate on time. So, I decided to give the CLEP tests a try. I found your site on the net and read feedback on your service from other sites I had found. All the feedback I read was great, so I decided to give InstantCert a try. I studied the InstantCert flashcards and followed the suggestions on your site, and I passed both test with flying colors! I just wanted to say Thank You, and keep up the great work! I wanted to write a note to let you know how invaluable your site is. I needed 21 credits to receive my degree. I was able to take and pass all 7 of the CLEP/Dantes test without failing any. It saved me a lot of time and money. I referred a friend who needed 18 credits and had previously failed 2 CLEP tests. After using your site to study she was able to complete all 6 tests in less than 3 months. I just wanted to say thanks again for the ability to use your site. I have taken my last test and if I passed, I won't need access to your site anymore but wanted you to know that this site is a lifesaver!! I don't believe I could have taken and passed as many tests as I did without the help of these study guides! I printed the fliers and gave them to my advisor at school to hand out to other prospective testers. I took the Principles of Management Clep test this morning at 10:30 am using only the Instantcert study materials and passed with a 66 score on the exam. I took the test exactly after one month of studying using Instanctcert's online study guide. I just wanted to thank you for the great service Instantcert is providing to busy parents like myself. With two kids aged 5 and 1, I have my hands full and it is a miracle that I passed. I just wanted to let you know that Instantcert ROCKS. If someone like me who is working full time as a software QA Engineer with two kids can pass the tests anyone can and believe me I don't have enough hours during the day (or night) to study. Just pass this on to people who may be having second thought about completing college, it can be done. I wanted to drop you a quick note, and let you know that I used InstantCert training to prepare for a number of CLEP and Dantes exams. I completed my last test on February 11th, and am now done with my undergraduate degree. To date, that means I sat for, and passed, seven exams using your preparation materials. InstantCert was much more valuable to me than the very low monthly cost. Even though I was a member for more than a year, my costs still were lower than if I had taken even one class in person during that time. Amazing! I just wanted to say "Thanks" for all your hard work, and helping me get through my program. Well I did what you and your site said for the US History II test, and.....I passed! The information on your site took me from knowing little about the concepts layed out in the test to being able to take it and pass in exactly one week, you'll note I subscribed to your site a week ago today. Thanks again for your site, I'll recommend to people like myself who are crunched for time before graduation. I am going to start studying away on your site now for the Intro to Psych test, hopefully meeting similar results. I took and passed the American Government CLEP exam after using your website for only a week. Thanks for offering a great no-nonsense product that I?ll definitely recommend to others. So far I have completed 4 CLEPs: History I,II, American Government and Intro Philosophy. I have another 4 to go. The study method works! The plan is to complete everything by March for admission in a Bachelor's program. Instancert has made this possible. I just wanted to share with you all the success I've had with the help of your site. I passed the Western Civilization II CLEP with a 67, the Introduction to Sociology with a 77, and the Biology CLEP with a 65. For $240 for the year, I saved thousands of dollars and hours of time attending classes. I'm starting my Master's this semester, so I don't need any more CLEP. I recommend the site to anyone I know who needs some extra credit. Keep up the great work - it really works!! I enjoyed using your program. I passed the Humanities, US History 2 and Intro to Computers using Instantcert. I wish I would have know about this sooner. I wanted to share my success with the InstantCert WebSite over the past six months. I just cancelled my subscription after six months of use and have 21 college credits to brag about using your site as my main resource. This site was very useful and is a great tool for any student that needs to accomplish their goals in a very short time frame. Thanks again for providing such a great resource. I am canceling my membership today as I have successfully completed all of my CLEP & DSST testing activities. I passed every test (7 ea) and received 21 semester hours of credit during the year that I have been a member. I just wanted to write and thank you for your website. I went in and took my very first CLEP test this past Saturday, October 22, 2005. I took Introduction to Psychology and passed the test!! I was so excited. Two other people were in the testing center with me and they didn't pass. I firmly believe that I passed because of your questions that I studied beforehand. AYour website is an outstanding service and value. Thanks so much!! I found your site on a Google search, hoping there was some good stuff out there as I tried to find faster ways to finish my BS and take care of prereqs for a Master?s program. I used your site to study for the MicroEconomics CLEP and passed with good margin. It?s a great resource, and I?ve recommended it to several of my classmates who are (like me) working professionals trying to finish their degrees. You should add a category to your ?reasons why I?m canceling? drop-down menu: ?I studied, I passed, and don?t need to worry about it any more!? Just wanted to let you know that I subscribed to InstantCert.com and used the site to study for 3 DSST exams that I took within a 30-day timespan. I didn't have time to read the books closely, but with the help of InstantCert.com I scored high enough to receive credit for each exam! It would have cost me $555 to take those classes at a community college and $3540 to take them at the university I'm attending; so the membership has been well worth it. I'm going to continue subscribing until I have my degree in hand. Too many friends have thought they were going to graduate, only to be told that they are a few credits short. If this happens, I know InstantCert.com will help me score high enough to get any remaining credits quickly and easily! I just cancelled my membership and wanted you to know why. (My reason was not listed as one of the choices.) I have taken 5 tests and passed them all! I will be graduating in November and I have all of the credits that I need!! Thanks for providing this service. I appreciate all of the help I received from Instantcert and I tell every college student I know about your service. I used Instantcert to study for two clep tests this summer. I studied only with Instantcert - no test guide books and I did not use the Clep website. I took both the Human Growth and Development (3 credits) and the Psychology of Education (5 credits) tests. I took the tests at George Fox University, which requires higher scores than the national standard to be considered a passing score. I passed both tests on the first try. Thank you for a great service. My son and his girlfriend plan to use it next year. I just took my first CLEP test, Principles of Management, and passed with flying colors. In fact, upon completion, the administrator said "Holy cow, I've never seen a score that high"! The material on your site is the reason why I did so well. Thank You! I am an adult student who returned to school to get my degree after 25 years. I plan to test out of all of the electives that I can using CLEP and your site! I didn't have the time, money or patience at 59 years of age for the classroom grind. Instead, I found your website. Now, one month later I have passed principles of Management, Sociology, and U.S. History Prior to 1874 and am about to CLEP test this week for marketing. That's all in three weeks time!! The only tool for studying I have used is InstantCert! It works and I am thankful it does!! Now all I have to do is find a college to graduate from because you all have pretty well filled out my missing credits! EXCELLENT!!! I had completed all my courses, but then the school notified me that I was three Humanities credits shy from completing my Bachelors program. I studied a CLEP exam book, bought at a local bookstore and took the CLEP exam, to only fail by "1". This wasn't going well... Once the school and I came to an agreement on other exams that would help me obtain the desperately needed credits, I began searching for study material. I came across the InstantCert.com website frequently and decided it was worth the try. The structure and organization of the material was great as it helped me absorb the information rather than just memorize it. I also noticed how the information was being updated as I studied, which was excellent because the study material was definitely on point with the exam. Needless to say, I passed my Dantes exam with flying colors and now have all my credits for completion of my Bachelors program!!! Thank you for such a great site with a wealth of information. I've passed my praises of your site along to some friends and wish you continued success!! Just wanted to let you know that I passed the humanities and western civilization I CLEP exams. Your service was an invaluable tool in accomplishing that goal. You were my primary study source for both of these exams. Although I did consult textbooks for both of the exams, the information provided on your website was more than sufficient to insure a passing grade. I breezed through both exams with relative ease. I would definitely recommend your service to anyone contemplating sitting for the CLEP exams. Thanks to you I have completed all of my remaining degree requirements and will be graduating with my BS I do have one suggestion that might be helpful for the western civ. I exam. I originally signed up for the Accounting CLEP because I have been doing accounting for 27 years and thought there would not be any problems with the exam. I'm glad I subscribed to your site. There was so much material that I had not been in contact with, and I am glad to say utilizing your site I passed and received the credit. I am currently utilizing your site to continue with other CLEP exams. I just wanted to drop a line and thank you for your great service. I would not have agressively pursued my degree were it not for the presence of a $20/mo practice testing service. 39 semester credits, including 2 upper division classes and all general ed electives except for Eng Comp and Speech. This study program was extremely successful for me. I study the material for approximately 8 hours two days before the exam and passed in the 80 percentile range. I am usually a C average student. Taking the CLEP saved me a lot of money since I am doing my classes online through Regis University. The cost of one class can cost up to 1000.00 dollars so paying the 55.00 dollars for the exam, 25.00 proctor fee, and the 19.95 for the study material saved me about 900.00. I really hope others take advantage of this service. I took the principles of management, never have taken a class in management before, and I am a nurse, and passed because of this service. I believe that Instantcert provides a valuable service and just wanted to pass on the kudos. Thank you for saving me time and money! I want to thank you for your website. It was very informative and helped me to pass my human growth and development clep exam. I tried reading the 550 page book, but it was boring, and frankly I just didn't have the time. After 6 days of practicing the questions from the website, I took the exam and passed with a very good grade. Just wanted to say that I think InstantCert is a great program! I successfully passed 8 CLEP test using InstantCert, with an average score of 63. It saved me a bundle on book costs & tuition fees for my elective classes. I?ve recommended you to several people, but most don?t seem to have the discipline to study on their own. Oh well, their loss! Again, great program! Keep up the good work! Below is a list of the subjects for which InstantCert offers flashcard prep courses. Click on the course's name to be taken to an individual product description page.